When my grandmother was still alive, she used to ask me for garlic whenever she was experiencing high blood. I find it weird because aside from the fact that garlic is used in cooking which has pungent and strong odor, garlic is also used in fiction to scare vampires. So, all the while, I used to tease my grandmother that vampires may not haunt us with the smell of garlic in her mouth. Now, I know why. With the new and promising research made which brings hope to humankind, it brings something to look forward to like a certain medical findings that can improve the life of diabetic people. Among the many serious health conditions, diabetes is one of the life threatening diseases. Majority of us can surely relate how diabetes can burden lives as we witness how one of the family members, friends, anyone close to you, or even yourself is threatened with the complications it may cause such as heart failure, damaged vision, nerve pain and many disheartening underlying complications. So therefore, the recent medical research published and revealed in the Journal of Agricultural and Food Chemistry shows a very promising and natural way to prevent the potential heart problems that can weaken the heart muscle. The answer is the garlic oil. Yes, the garlic oil that is commonly used in any cuisine. Hence, let us all learn how garlic oil can be best remedy and prevention to diabetes. The team effort of the scientists from Chung Shan Medical University and China Medical University noted how patients with diabetes have two times the risk of dying from heart disease as the main culprit of any diabetes-related deaths. The head of the new research, Wei-Wen Kuo stated that based from the data gathered from previous studies, it shows that garlic, in general, can protect people from heart disease as it can control the abnormal rise of blood sugar levels of diabetic. Further research has been made to prove that the garlic can really provide numerous heart benefits and can prevent the deadly cause of diabetic cardiomyopathy (DCM), clinical condition of ventricular dysfunction in the absence of atherosclerosis ( build up of cholesterol) and hypertension. Rats with diabetes are the subjects of the study. The rodents were fed corn oil and garlic oil and as expected, the subjects who were given garlic oil showed changes in their cardiovascular health and the changes can be directly associated to heart disease prevention. Scientists found abundant and potent antioxidant properties in garlic, approximately 20 substances that may protect the heart from any cardiovascular diseases. Garlic is one of the oldest cultivated plants used in culinary and medicinal uses. Widely recognized as natural antibiotic and antiseptic as it prevents, heals, and ease various illnesses. The allium sativum, the bulb of garlic contains the medicinal substances. It contains a volatile oil with allin which component is decomposed and crushes into allicin and gives its particular and unique scent. 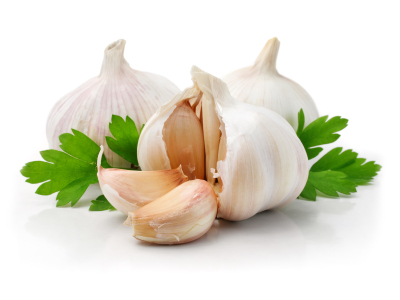 Another important health substances of garlic are vitamins such as A,B1,B2 and vitamin C; essential minerals like potassium, magnesium, phosphorus, and calcium; trace elements including manganese, cobalt, and copper; and some important components of saponins, phenolic acids, glucosinolates, and flavonoids. Garlic is found as great solution in slowing the growth of viruses, fungi, and bacteria and used as remedy for head colds, intestinal ailments, and dermal fungal. Garlic is also known as natural antibiotics that can fight E.coli (bacterium found in lower intestine) and staphyloccus (bacterium cause of staph infections) because the use and consumption of garlic can strengthen our resistance to infection. Garlic shows positive correlation in blood vessels. Regular uses and consumption can facilitate blood flow, effectively elevates fat in bloodstream, and lowers the blood pressure. It also prevents creation of blood clots and platelet aggregation that may lead to the verge of heart attack, strokes, and thrombosis. It was proven that 2 grams of garlic daily and taken for four consecutive months can normalize the elevated cholesterol and blood pressure by 12 percent. The allicin compound can break the considered harmful fats that build up on artery walls. Regular consumption of foods with garlic can prevent atherosclerosis, a medical condition which affects the arterial blood vessels that hardened the arteries causing the formation of plaques within the artery walls. The antioxidant effects of garlic can protect our body from any destructive effects of the damaging free radicals which causes premature aging and various health diseases. An American study proved on their medical research that the an average of 3.5 and almost 28grams of fresh garlic can reduce the risk of intestinal cancer by 75% and stomach cancer by 50% as garlic can have good effects in digestion process by relieving cramps and bloating and protects the stomach from any malignant diseases. Other uses of garlic are for relieving rheumatic pain, treatment of bronchitis, prevention of fever, and consume as diuretic. Too much of garlic can be poisonous. I guess this is applicable to all, right? Too much of everything can be lethal to life, same thing goes with large doses of garlic. The sulfur-containing compound of garlic can have diverse effects to human such as stomach ulcers, vertigo, anemia, suppression of testicular functions, and bronchial asthma. Take note also that people suffering from hemophilia (hereditary disorder which impairs the body to control the blood clotting) are not advised to take garlic medicinally. Experts only recommend 2-5 grams of garlic daily; for garlic oil, it should be 2-5 milligrams; 0.4-12 grams for powdered garlic, and 300-1000 milligrams for garlic extract.